Say goodbye to sushi, because now the trendiest and newest Japanese restaurant in Madrid is: Hattori Hanzo. An izakaya (a typical Japanese tavern) specialized in Japanese street food, that are like “Japanese tapas”, and skewers. Lately, the concept of izakaya has became very popular around the globe, and this is the first one to land in Madrid. Izakaya literally means “sake shop” and in Japan it’s the most common after-work place. Generally, the most common way to eat in a izakaya is to share various dishes among your friends, forget about individual plates. Eat a lot and drink a lot. It’s the Japanese way. The best about Hattori Hanzo, besides the food of course, is the decoration. 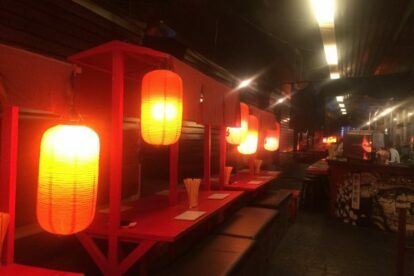 Old traditional Japanese style: Akachochin red lanterns, wooden tables, and bamboo cups. The curtains of the entrance will make you travel to Japan immediately. My recommendation, besides the obvious tempuras and skewers, is Takoyaki. A ball snack filled with octopus, tempura scraps, pickled ginger, and green onion. Amazing!